[INQ. NO. 1504E08] Transform your computer room or data center with Hankyung I-NET’s Smart Cooling Server/Network Rack (Smart Cooling Rack) and Smart Power Distribution Unit (SPDU) Total Green IT Solution. Turn off the inefficient high energy consuming and traditionally unreliable air conditioner to cool your computer center. Operators don’t have to cool the entire room just to keep the servers cool. Reduce energy consumption, lower your company’s carbon footprint, and save on your electric bill by cooling only what needs to be cooled, the servers. The Smart Cooling Rack is a completely enclosed selfcooling server rack with a built in air conditioner that automatically regulates the temperature and humidity levels inside the rack as the server demands rise and fall throughout the day. With the LCD user interface touch screen on the front door panel, operator can adjust and set temperature ranges, fan speeds, humidity levels. User can also make the same adjustments from anywhere at any time using the web remote user interface via computer or handheld smart devices and phones. 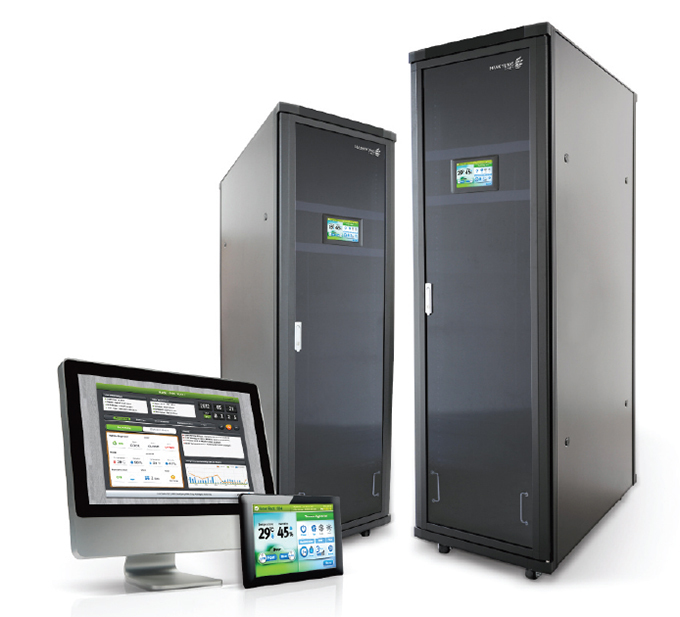 The internally mounted Smart Power Distribution Unit inside the rack monitors and records power usage and carbon emission of everything plugged into it and receiving power through it in real time via the web user interface. All power usage is stored every minute for an entire year. With the data, users can generate power consumption and carbon emission reports. In the event of a sudden increase in temperature, the smart rack will go into Emergency Operation Mode to compensate and quickly reduce the heat. An alarm is set off and an alert message is sent to designated users via phone or email. For quick and easy maintenance the A/C unit simply slides out from the bottom of the Rack and can be repaired or replaced for repairs elsewhere. Consuming only 800W of power to cool, this provider’s self-contained Smart Cooling Rack is a completely unique stand-alone mobile Green IT Solution that eliminates the need for additional energy wasting external cooling equipment and raised floors. [INQ. NO. 1406E08] Transform your computer room or data center with HANKYUNG I-NET’s smart cooling server/network rack (smart cooling rack) and smart power distribution unit (SPDU) total green IT solution. Turn off the inefficient high energy consuming and traditionally unreliable air conditioner to cool your computer center. Operators don’t have to cool the entire room just to keep the servers cool. Reduce energy consumption, lower your company’s carbon footprint, and save on your electric bill by cooling only what needs to be cooled, the servers. The smart cooling rack is a completely enclosed selfcooling server rack with a built in air conditioner that automatically regulates the temperature and humidity levels inside the rack as the server demands rise and fall throughout the day. With the LCD user interface touch screen on the front door panel, operator can adjust and set temperature ranges, fan speeds, humidity levels. User can also make the same adjustments from anywhere at any time using the web remote user interface via computer or handheld smart devices and phones. In the event of a sudden increase in temperature, the smart rack will go into emergency operation mode to compensate and quickly reduce the heat. An alarm is set off and an alert message is sent to designated users via phone or email. For quick and easy maintenance, the A/C unit simply slides out from the bottom of the rack and can be repaired or replaced for repairs elsewhere. [INQ. NO. 1312E29] Transform your Computer room or Data Center with HANKYUNG I-NET’s Smart Cooling Server/Network Rack (Smart Cooling Rack) and Smart Power Distribution Unit (SPDU) Total Green IT Solution. Turn off the inefficient high energy consuming and traditionally unreliable air conditioner to cool your computer center. Operators don’t have to cool the entire room just to keep the servers cool. Reduce energy consumption, lower your company’s carbon footprint, and save on your electric bill by cooling only what needs to be cooled, the servers. The Smart Cooling Rack is a completely enclosed selfcooling server rack with a built in air conditioner that automatically regulates the temperature and humidity levels inside the rack as the server demands rise and fall throughout the day. With the LCD user interface touch screen on the front door panel, operator can adjust and set temperature ranges, fan speeds, humidity levels. User can also make the same adjustments from anywhere at any time using the web remote user interface via computer or handheld smart devices and phones. 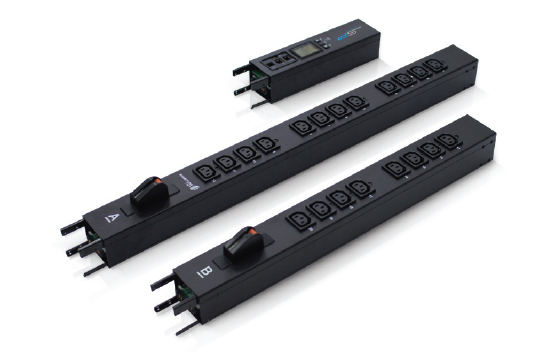 The internally mounted Smart Power Distribution Unit inside the rack monitors and records power usage and carbon emission of everything plugged into it and receiving power through it in real time via the web user interface. All power usage is stored every minute for an entire year. With the data, users can generate power consumption and carbon emission reports.